Red imported fire ants, receive their name due to their ability to inflict painful bites and stings. They are an invasive species found throughout the southern United States, introduced into the U.S. in a shipment of cargo from Argentina. The Bug Dude can provide professional pest control in Fort Worth to rid your home and lawn of fire ants. one or more queens. Common signs of fire ant activity are the presence of fire ants, and their earthen mounds. It’s common for mounds to appear after recent rain. When fire ant mounds first appear, contact The Bug Dude for professional pest control in Fort Worth. Untreated fire ant mounds will rapidly escalate into a mass infestation. Fire ants are omnivores, feeding on animal or vegetable sources of food. They are known to eat meats, greasy and sweet food sources, insects, earthworms, ticks, boll weevils, spiders, arthropod eggs, flea larvae, cockroach eggs, honeydew, and other sweets. Plant sources include seeds, including corn, sorghum, soybeans. Plants include, corn, potatoes, okra, and citrus fruit among others. Fire ants will also eat young and newborn vertebrate animals, including birds, rodents, and calves. In addition, fire ants readily consume carrion (dead animals). Contact the Bug Dude today to schedule effective pest control in Fort Worth. When fire ants attack, they use their mandibles to grip their prey, and inject venom through a stinger. Fire ant stings are painful and may be fatal to persons who are allergic to their sting. Fire ants are known to attack in large numbers, and considering a colony may contain 100,000 to 500,000 insects, the likelihood that multiple stings may occur can be high. Professional pest control in Fort Worth can manage lawn infestations, and secure against indoor invasions of fire ants. They can nest about anywhere in and around your house, on lawns, in walls, stumps, and even under foundations. Without treatment, fire ants will not go away. A fire ant colony can live a relatively long lifetime, and do-it-yourself ant control can be ineffective due to the potential for high population numbers, and the number of colonies. Do-it-yourself treatment provides partial control only, whereas professional pest control in Fort Worth has the goal of eradication, and prevention of new colonies from entering your property from other sources. Furthermore, the majority of home remedies doesn’t consider that different kinds of ant infestations require different treatments. Professional pest control in Fort Worth will identify the species of ant infestation(s), and provide the appropriate treatment. Clean up food crumbs, and drink spills. In addition, store non-refrigerated food in tightly sealed containers. Throwing leftovers on the lawn close to the home will attract foraging ants. Fire ants can enter a home through poorly sealed windows, through gaps, and entrances of wiring, cables, ducts, and plumbing. Seal these entry points tightly with caulk or expanding foam, and contact The Bug Dude for pest control in Fort Worth. Moisture from plumbing leaks (indoors or out), or a leaky roof can attract fire ants and other pests into your home. Inspect the soil of potted plants for fire ants before bringing them into the. Inspect other objects such as toys, before bringing them indoors. Fire ants will colonize the cavities of plastic toys, and other hollow objects. Check the toys before children play with them, and before bringing them inside. Store open bags of pet food in tightly sealed containers. Do not leave pet food out to avoid providing a food source for fire ants. Though mulch is beneficial for plants, it provides a convenient environment for fire ants. Talk to your pest control professional in Fort Worth about alternatives in your area. Keep shrubbery and trees trimmed back at least 2-3 ft. from the home to prevent pests from entering the home. 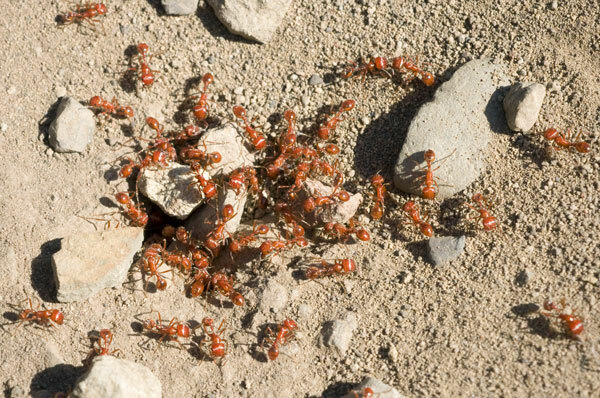 Effective fire ant treatment requires professional pest control in Fort Worth. The Bug Dude can provide the services you need to rid your lawn and home of fire ants, with professional pest control in Fort Worth. We serve Fort Worth and the surrounding areas with professional pest control services.